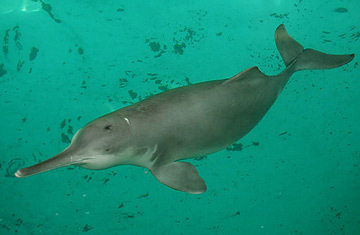 A euryhaline species of Oceanic dolphin is the Irrawaddy dolphin. It is found in several discontinuous sub-populations in estuaries, rivers, and near sea coasts of the Bay of Bengal and other areas in South-East Asia. It was first scientifically described in 1866 by Sir Richard Owen based on a specimen that was discovered in the harbour of Visakhapatnam, India in 1852. There are 2 species within its genus. 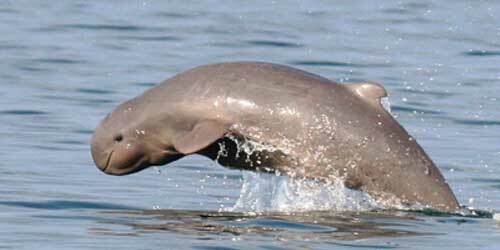 Although it is a dolphin, the Irrawaddy Dolphin is actually closely related to the Orca. They are similar to the Beluga in appearance. They have a large melon, as well as blunt and rounded head. Its dorsal fin is short, blunt, and triangular. The flippers are broad and long. It is lightly coloured all over its body but it is slightly more white on its underside. Adults weigh over 130 kilograms and are 2.3 metres long when they are fully matured. The maximum recorded length was a male Irrawaddy dolphin from Thailand which reached lengths of 2.75 metres. It is sometimes called the Irrawaddy River Dolhin. 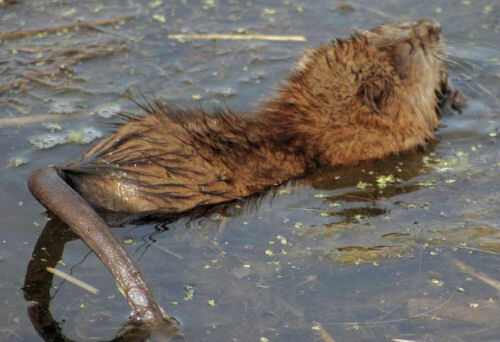 However, it is actually not a true river dolphin. 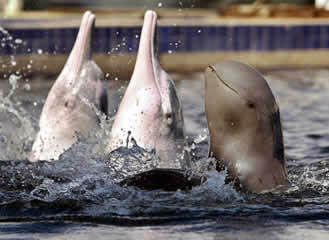 Instead, it is an oceanic dolphin which lives in brackish water near river mouths, coasts, and estuaries. It has a well-established sub-population in freshwater rivers as well such as the Irrawaddy River, Mekon, and the Ganges. Its range extends all the way east to the Philippines and New Guinea. It is also often seen in the bays and estuaries of Borneo Island. Sightings are reported in Sandakan in Sabah, Sarawak, and Brunei. In addition, a specimen was collected in East Kalimantan’s Mahakam River. Threats to the Irrawaddy dolphin include entanglement in fishnets and the degradation of its natural habitat. However, conservation efforts are being made at both a national and international level to help alleviate these threats. International protection against trade and hunting is provided by both the International Union for Conservation of Nature as well as the Convention on International Trade in Endangered Species of Wild Fauna and Flora. However, enforcement is essentially the responsibility of the individual countries. The dolphins are categorised as being critically endangered by the IUCN in Malaysia, Myanmar, Laos, Thailand, and the Philippines. In India and Bangladesh, it is thought of as a vulnerable species.